Simply put, The Fischers' have lead the compressed air controls industry since the first PLC Controls installation in 1997. Bringing advanced PLC algorithms together with vivid and highly user friendly graphical interface systems, TFG Controls simply dominates the industry with energy efficient, reliable control solutions. Using proven, industry standard PLC's, HMI, and SCADA solutions, TFG Controls can be integrated with any make or model air compressor, as well as all Powerhouse support equipment. 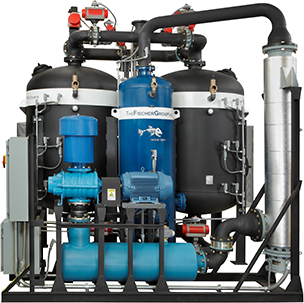 Including, but not limited to Dryers, Cooling Towers, Pumps, Water Systems, Chillers, and various other industry specific equipment. Featuring the most energy efficient dryers on the market. © Copyright 2019 The Fischer Group, Inc.